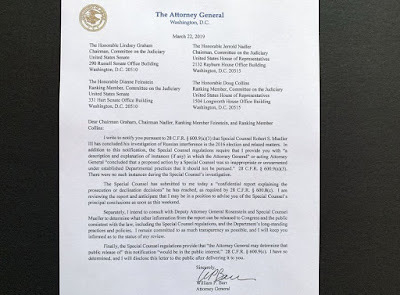 Now that the Mueller Report has morphed into the Barr Letter, it’s time to put 2 and 2 together. First, the Mueller Report emphatically stated that the Trump administration didn’t interfere with any request from the special counsel. 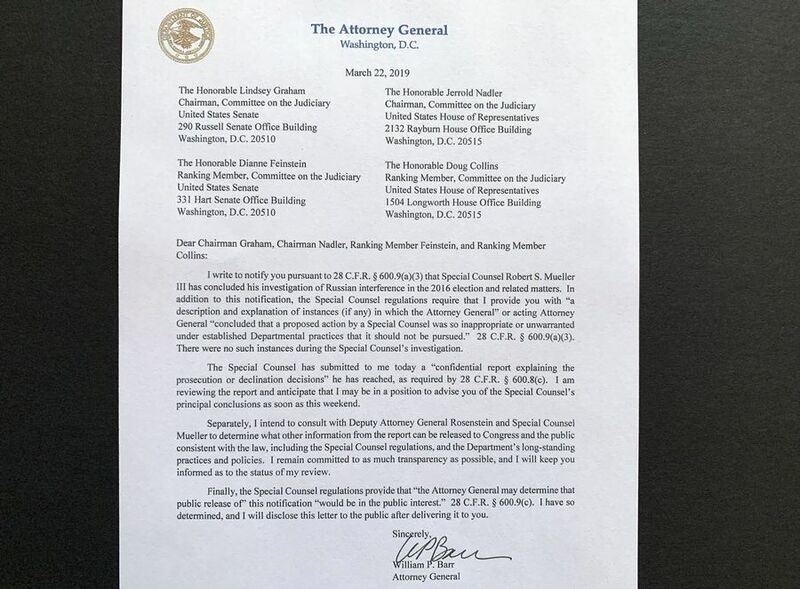 Next, Attorney General Barr and Deputy Attorney General Rosenstein announced in their letter that Special Counsel Mueller hadn’t reached a decision on obstruction of justice. Then they announced that they had concluded that President Trump hadn’t obstructed justice. I can’t wait to hear Chairman Nadler explain how a president (or any other member of the executive branch) could obstruct justice when a) there wasn’t an underlying crime and b) the special counsel’s funding requests were granted each time he made one. It’s difficult to obstruct when the acting AG is saying yes all the time. There’s no doubt that Mueller should’ve made the decision on whether President Trump had obstructed justice but it’s also true that he all but made that determination that President Trump didn’t obstruct justice in his Friday report. The naysayers have been wrong all along. They were either declaring that “the walls are closing in” on President Trump or that some journalistic rag had just published “a bombshell” report that would surely sink President Trump. When Special Counsel Robert Mueller transmitted his report to US Attorney General William Barr, speculation started as to what the report might say. Some speculation stated that there might be sealed indictments against President Trump sitting in New York’s Southern District. Other speculation said that President Trump had been vindicated, though those rumors were a bit tempered because of potential investigations in state courts as well as in federal courts in New York and Virginia. Later in the evening, a report came out that there weren’t any additional indictments and that Robert Mueller was leaving the office of special counsel and that only a handful of low-level staffers would be sticking around to finish closing the office. If that’s true, the Democrats’ ‘bombshell’ just blew up in their face. Nonetheless, Corey Booker is attempting to raise money off the report, first telling supporters to sign a sheet if they think Attorney General Barr should release the entire report. If they sign up to have Gen. Barr do what he’s promised to do, then the supporter is directed to a page where they can contribute to Sen. Spartacus’s campaign. In the second paragraph, it’s stated that nobody in the Trump administration interfered with Mueller’s investigation. Now that we know that there wasn’t collusion, that the Trump administration didn’t get in Mueller’s way and that the special counsel investigation is essentially finished, Democrats are in a helluva pickle. Mr. Gowdy: I think the whole world has read the memo and — or most of the world. My question is whether or not Director Comey — I think he’s already answered he had no conversations with Rod Rosenstein. My question is, whether or not — and he’s entitled to his opinion — whether or not he believes that that framed a sufficient factual basis for his termination as the FBI Director. Ms. Bessee: He is entitled to his opinion, but to the extent — because he also stated that he is also a witness in the investigation. Mr. Gowdy: Which investigation is he a witness in? Ms. Bessee: To the special counsel. He said he is a potential witness. Mr. Gowdy: Well, you just said witness. Is there an obstruction of justice investigation? Ms. Bessee: I believe there is an investigation that the special counsel is looking into. Mr. Gowdy: Well, we all know that. Is it an obstruction of justice investigation? Ms. Bessee: Mr. Chairman, can you rephrase the question, please? Mr. Gowdy: Yes. Director Comey, you’re familiar with the memo drafted by Rod Rosenstein. You have not talked to Rod Rosenstein, as I understand your testimony. Do you believe the memo, just on the cold four pages of the memo, four corners of that document, do you believe it provides sufficient basis for your termination? Even if you would have done it differently, is it a basis for your termination? Mr. Comey: I can’t answer that, Mr. Chairman, because it requires me to get into the mind of the decisionmaker, who is the President, and I’m not in a position to do that. Mr. Gowdy: Do you have any evidence the memo was subterfuge to fire you, but not for the — but for a different reason? Mr. Comey: I have no evidence at all about how the memo came to be created. I know that it was part of the documentation that was attached, what was sent to me, delivered to the FBI on the day I was fired. That’s the only thing I have personal knowledge of. According to Chairman Gowdy, Comey replied “I don’t remember” 71 times, “I don’t know” 166 times and “I don’t recall” 8 times. That’s a pretty pathetic performance for a man leading the premier law enforcement agency in the world. These weren’t insignificant questions about things that happened long ago. They were central questions about major recent investigations that he supposedly headed. It’s rather disgusting to hear Mr. Comey talk about transparency after hiding behind the FBI’s attorney. It’s clear that the FBI’s attorney’s mission was singular: protect Mueller. The FBI’s attorney didn’t care a whit about informing the public or the committees. She primarily cared about hiding important facts. If I got paid $10 for each article I’ve read, pundit I’ve heard and montage I’ve watched that’s predicted Mueller was on the verge of slamming the jail cell on President Trump, I’d be rich. This article is just the most recent I’ve seen. There’s no doubt that some of the people who’ve been investigated (I’m thinking Manafort and Stone mostly) are worthy of society’s disdain. To be blunt, they’re skunks. If both rot in jail the next 50 years, I won’t lose a split-second of sleep over it. I’d love seeing the documentation or text messages that shows Trump knew what Cohen was doing. Until they have that, they’ve got nothing. Period. Hatred of a person isn’t proof of a crime getting committed. At some point, the Mueller ‘investigation’ will end. At that time, those of us who appreciate integrity will start telling historians who will listen that Mr. Mueller is a skunk who doesn’t have an ounce of integrity. He’s just a malicious man who’s upset that he wasn’t hired when Jim Comey got fired.